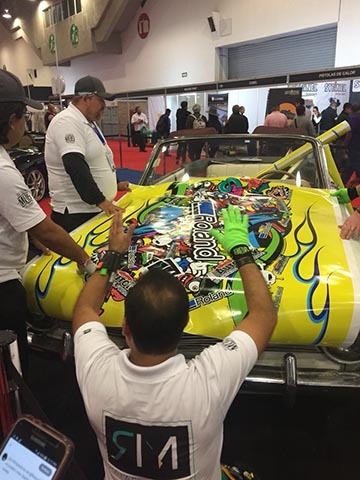 Irvine, Calif. – Roland DGA will be offering its popular Born-to-Wrap vehicle wrap workshop in Mexico for the first time ever, giving attendees an opportunity to learn the tricks of the trade from industry experts. Like Roland’s U.S.-based Born-to-Wrap classes, the comprehensive two-day workshop, to be held July 19-20, 2018 in Mexico City, will combine classroom instruction with hands-on wrap installation in a simulated shop environment. Leading the Mexico City workshop will be award-winning wrapper Rafael Muñoz, director at Prodigyo Imagen Visual, who will teach attendees everything they need to know about running a successful wrap operation. Muñoz will share his vehicle wrap secrets – lessons learned over many years – while also providing instruction on the use of Roland’s advanced digital inkjet printers. For additional information on the upcoming Mexico City Born-to-Wrap workshop (in Spanish only), visit https://www.rolanddga.com/es/soporte/roland-academy/workshops/btw-mexico-basics-and-beyond. To learn more about Roland DGA’s U.S.-based Born-to-Wrap workshops, visit https://www.rolanddga.com/support/roland-academy/workshops. Award-winning vehicle wrap specialist Rafael Muñoz (kneeling in photo) performs an in-booth wrap demonstration at a recent trade show. Muñoz will lead Roland DGA’s upcoming Born-to-Wrap workshop – the first to be held in Mexico – July 19-20, 2018 in Mexico City.